A long time ago (in what seems like it must have been a galaxy far, far, away), it was possible for someone to be coy about "daddy issues." In the following clip, Mary Martin performs "My Heart Belongs To Daddy" (the Cole Porter song that made her famous following her Broadway debut in 1938's Leave It To Me!). In her autobiography (My Heart Belongs) Martin confessed that at the time she was singing that song she was clueless about the true meaning of some of Porter's lyrics. In 1924, the popular comic strip, Little Orphan Annie, gave birth to a character known as Daddy Warbucks. In today's sexual marketplace, the lexicon covering daddy issues has progressed far beyond a sugar daddy (which was also the name for a popular caramel candy that was ever so sweet to lick). Many single women will refer to a man as their "baby daddy" while gay men have seemingly mastered the linguistic art of using the word "daddy" as a term of endearment, empowerment, and a literary aphrodisiac. Over the years, the question "Who's Your Daddy?" has taken on new meanings in popular culture. Just as there are plenty of websites devoted to women seeking sugar daddy arrangements, gay men have become expert at seeking intergenerational relationships for fun or profit. 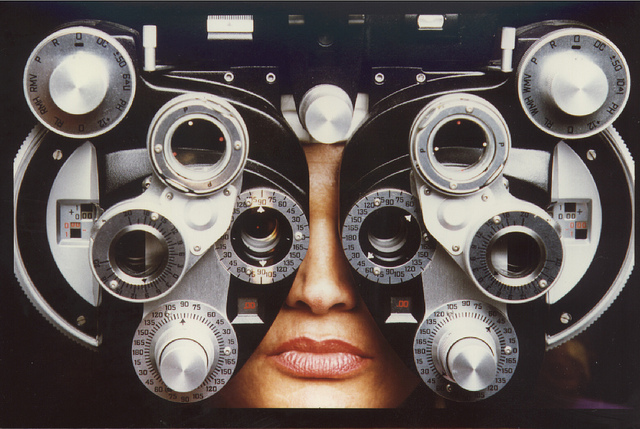 If you've ever gone to an optometrist to get a prescription for corrective lenses, you're familiar with the process of sitting in a chair while someone uses a phoropter to test different lenses in order to determine which will yield the clearest images. I mention this because, after attending the world premiere of Christina Anderson's new play, Pen/Man/Ship, at the Magic Theatre, I had the strangest thought. Whereas Melville's Captain Ahab went in search of a white whale, Anderson seemed to be sailing the southern Atlantic in search of a purpose (or perhaps a porpoise). The playwright frequently offers hints about her characters in the play's script, but fails to develop them further or explain them clearly to the audience. In a dialogue between the playwright and Magic's dramaturg, Dori Jacob, that is printed in the program (appropriately entitled "Finding The Anchor"), Anderson describes how the project grew out of one of Paula Vogel's "bake off" writing projects. Although she had never been on a ship, did not know how to swim, and wasn't exactly sure where she was going, Anderson was interested in finding an African-American theme set in the Victorian era. "I consider myself a political writer," she explains. "The only thing I knew was that I really liked the idea of having these people of color on a ship." At the time she was working on P/M/S, the trial of George Zimmerman for the murder of Trayvon Martin was dominating the headlines. The concepts of "Stand Your Ground" and "Tonight You Will Die" had an obvious impact on Anderson's writing process. My guess is that a brief encounter with Herman Melville's unfinished novella Billy Budd (in its prose, film, or operatic format) might have offered Anderson a stronger sense of shipboard life in an all-male environment. Charles (Adrian Roberts) is an African-American surveyor who has chartered a ship and hired its crew for the long voyage to Africa. His employers are a group of businessmen who belong to the American Colonization Society and are planning to set up a penal colony in Liberia for blacks who are unruly or unhappy with life in America. Charles is a repressed soul who resents anyone challenging his authority. A devout Christian, he has prepared himself for the long transatlantic voyage by bringing on board a sizable supply of gin (which gives him almost as much solace as his Bible). 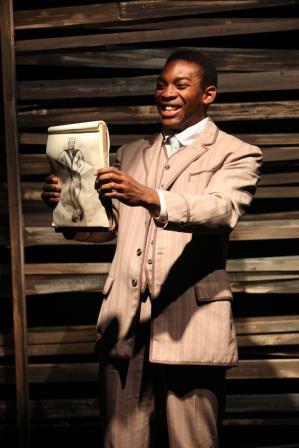 A successful and educated African American, Charles considers himself as belonging to a social class far above the "beasts" who form the ship's crew. He prefers to remain in his cabin, writing in his diary, praying, and drinking and refuses to go up on deck and mingle with the men he feels are his inferiors. Charles also resents the fact that Jacob and Ruby seem to be making friends with the sailors (who are more than happy to talk with them), which undermines his authority. Jacob (Eddie Ray Jackson) is Charles's son, who was caught in a police raid on "a brothel for fairies" and has shown up at the dock just before the ship's departure with a strange woman who will accompany him on the long voyage. As much as his father tries to get Jacob to describe his relationship with Ruby, Jacob refuses to discuss the matter. He and Ruby spend a great deal of time together while at sea, although no one is really sure what they are doing. An amateur artist, Jacob likes to spend his spare time doing pencil sketches of the crew members (which, to say the least, flatter their masculinity). One of the sailors he has sketched is an amiable young man named Monty. Ruby (Tangela Large) is a self-educated African American woman who answers to and is afraid of no man. She fled the South after it was discovered that she had been reading books belonging to her mistress. 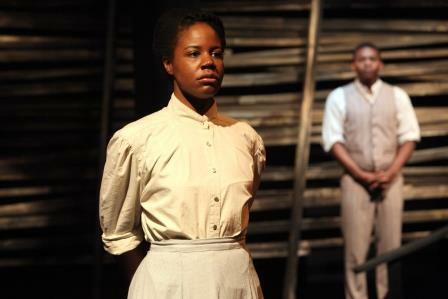 Had she not left quickly, she would have simply been another piece of "strange fruit" hanging from a tree. Ruby is determined to leave America (which has been a source of incredible shame and pain for her) and start a new life in Liberia as a free Black woman. 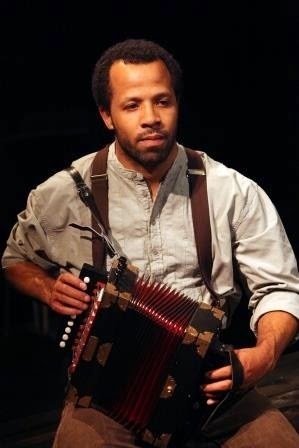 Cecil (Tyee Tilghman) is a member of the crew who plays an accordion for entertainment. He understands that he's not like the rest of the crew and can't comprehend why Charles has taken a liking to him. However, because Cecil's father was an angry alcoholic, he recognizes the same symptoms in Charles's increasingly worrisome mood swings. There are many plot points in Anderson's script that, while qualifying as fanciful fictions, are downright ludicrous in terms of life at sea in a traditionally all-male environment. What caused the captain's sudden, unexplained death? Why wasn't he buried at sea? Why would the ship's crew turn to Ruby instead of the first mate for leadership after their captain's death? Because Anderson's drama takes place on a sailing ship, it would be a cheap gag to suggest that the answers are blown in the wind. However, if one looks at her characters through a slightly different lens, some intriguing thoughts quickly present themselves as likely answers. Charles has a near pathological hatred of women and was an uncaring husband as his wife lay dying (which might suggest a closeted gay man who married a woman in order to keep his sexual identity a secret). He may be guilt-ridden by the thought that something in him could have caused his son to be gay (it's bad enough that paying Jacob's bail cost him a pretty penny). When Charles hears Jacob talk about how friendly Monty has been -- and when his son shows him the sketch he drew of Monty -- it's easy for Charles (who has been relying on a dangerous combination of gin and Jesus to pray and drink away the gay) to think of Monty as the devil. When Monty approaches him on deck (in what was most likely a friendly gesture), Charles instantly goes into "gay panic" mode. Jacob is a young gay man who has lost a great deal of faith in the Bible. Although he loves his father and is extremely loyal to Charles, Jacob has learned how to stand his ground against his father's bullying. Ruby didn't get to where she is by being helpless or depending on men for her happiness. She's an intelligent, take-charge lesbian who sees through Charles's delusions of grandeur and is primarily interested in getting to Liberia. While Angrette McCloskey's unit set necessitated some clumsy entrances and exits, Sara Huddleston's powerful sound design helped give a strong sense of the ship's creaking and groaning in response to the pressures of wind and waves. 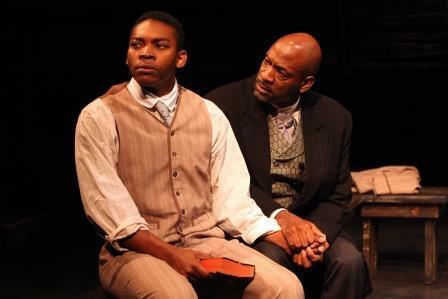 Under Ryan Guzzo Purcell's stage direction, the four actors gave exceptionally strong performances, with special kudos for Adrian Roberts as the tortured Charles and Eddie Ray Jackson has his son, Jacob. The first time I saw Alec Mapa perform live ("I Remember Mapa"), I was laughing so hard I was afraid I might choke on my own snot. The energetic Filipino-American stand-up comic (a native of San Francisco) likes to describe himself as "America's Gaysian Sweetheart." A popular performer at fundraising events, his quickness and wit have always allowed him to shine.